I have experienced the frustrations and challenges that leaders in schools face from both sides of the fence. As a teacher and leader myself I had to constantly shift and adjust to changing goal posts, work around shrinking deadlines and time limits, and still try to remain calm and collected. As a consultant at LearnMaker I work with a wide range of leadership teams to apply theories behind effective project management in school. In this article I will offer ideas, practical steps, and personal experience spanning over ten years in education, and over three years working with multinational companies, to share with you what we’ve found to work well. So to begin, one of the fundamental systems that every school must develop is the ability to manage projects. With a simple management process, schools can overcome problems with organisation, communication and tracking. In this post I’ll provide 5 steps on how to adapt and apply these processes in your school. Ever been to a meeting that lasted for over two hours or where the previous items were never followed through? My teaching career was crammed with meetings like these, in fact most meetings I attended were rarely less than an hour, and often ended in a discussion about something completely irrelevant to the task at hand. Often meeting agendas were sent through on the day, rooms changed last minute, important attendees were absent and items were changed during the meeting. Not very productive. The key is to have one system in which everyone is kept in the loop. You may need to have private conversations with individuals within your team but, a central and simple system is imperative, for this we use MeisterTask. One of the difficulties when managing a project is making sure everyone is notified. I’ve had this problem on many occasions. You send out an email to all relevant team members but accidentally leave someone off the list, so need to send it out again. These actions take time, cause stress, and slow down the project. Similarly, in most schools I’ve taught in, there’s a preferred device to use, so if you turn up with a mobile phone that isn’t supported you often have to cobble together a solution of workarounds. Having a system which works across platforms, and is truly mobile is fantastic. It means your team members can have notifications as they like. Perhaps a pop-up on their phones or an email breakdown of the day’s events. 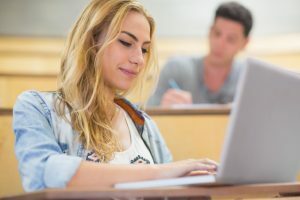 Staff members can work how they like, while guided by the system and free to interact how they see fit, as they don’t need to be at their class desktop. 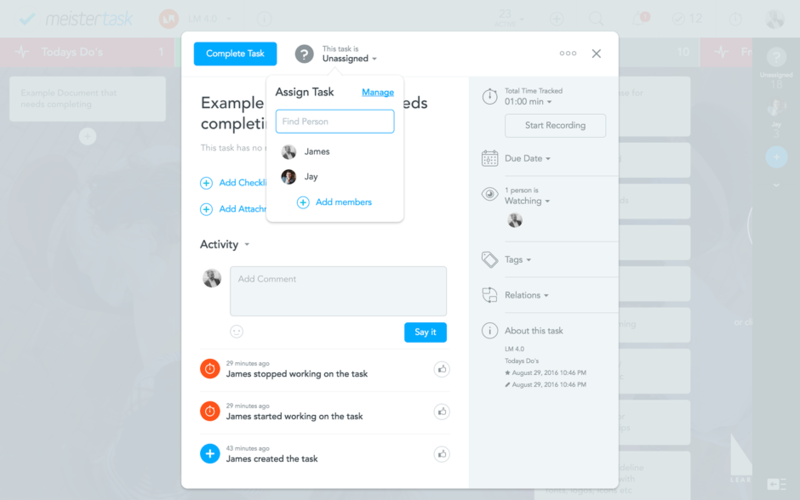 Using MeisterTask, team members on the right-hand column have one single place to chat, share resources, and work collaboratively. The simple commenting system, coupled with notifications, means teams have one point of contact for any project. As a teacher, the process of working on planning documents would always frustrate me. We would hold planning meetings using various versions of the same school improvement document – annotated by hand, reprinted, online versions, sketches and notes. We would spend hours trying to consolidate the different versions as they were never up-to-date. 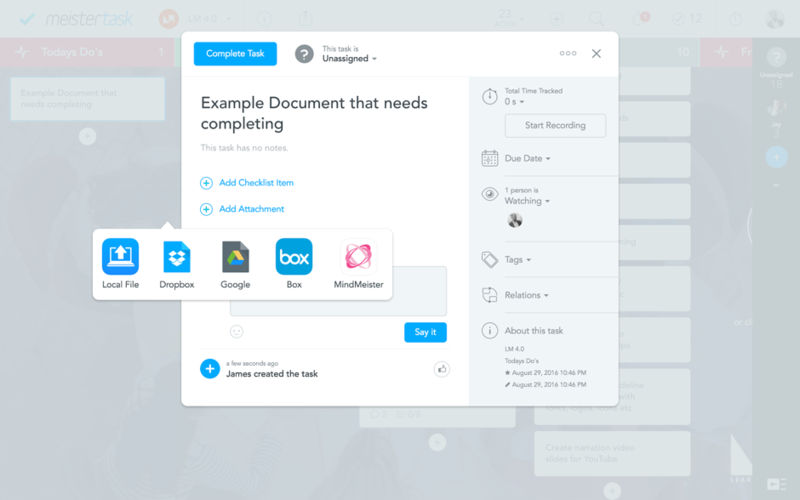 Having a central place to store, share and work collaboratively on resources means your team can work on live documents, monitor version changes, and communicate and annotate on team documents. Once every so often our IT school improvement plan would be wheeled out (sometimes literally, when printed they were huge folders) and the senior team and teaching staff would run through it, perhaps updating, mostly discussing what went wrong or not. Inevitably these meetings would last forever and nothing substantial would get done. The problem always came down to communication. People were left out of the loop, tasks were left undone, or people had conversations that weren’t recorded. Often deadlines were missed. Having a project management system which included all of the relevant details – a breakdown of tasks, staff members responsible, projected cost, deadline, and benefits if the tasks were completed – would have solved virtually all of the issues I witnessed. 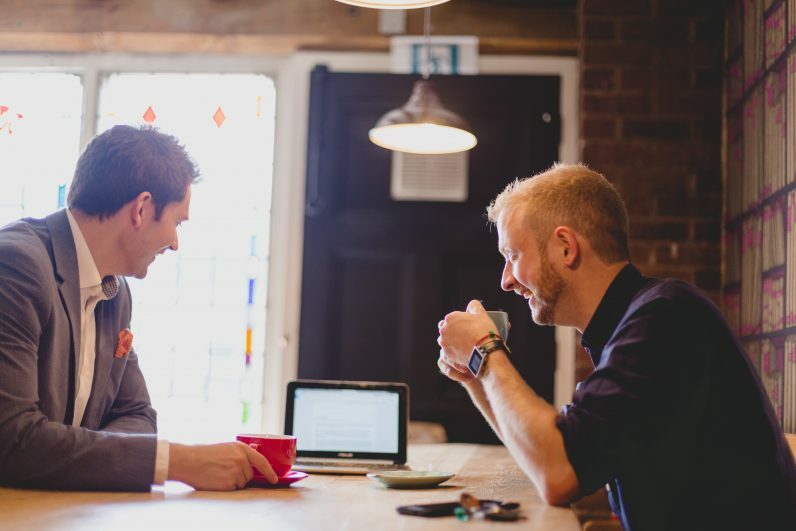 Many schools have several methods which allow staff to communicate well – often though, many leaders find communication is one of the key challenges they struggle to solve. If you think of these as multipliers, one conversation could have many multiple routes to confusion. For example, I have a face to face conversation with you in the corridor about a meeting next week. I say I will email you the details. Back at my office I send you an email and type an agenda to place in your pigeon hole. You read the agenda, and phone me for a slight alteration. I email back the adjustment, then print a copy for all the staff. You can see how this could get tricky with multiple staff, each having multiple ways of communicating – it becomes a spider’s web of communication lines. The odds of something going wrong or being left out increasing dramatically with each multiplier. Now if you layer onto that the movement and alteration of documents, the communications system becomes far more complicated. In addition, staff often use different devices – some have mobile phones, others tablets, some use good old desktop PC. One version of the file won’t open correctly on a particular device so we have to convert the file to make it work. A nightmare is created. This, I can guarantee, has or will happen at some point in your school. Being able to manage communication and file sharing through one project management system means your staff will only have one place to go to find what they need. Attachments can be viewed at the click of a button and don’t have to be searched for in a folder structure that requires a Doctorate to understand. 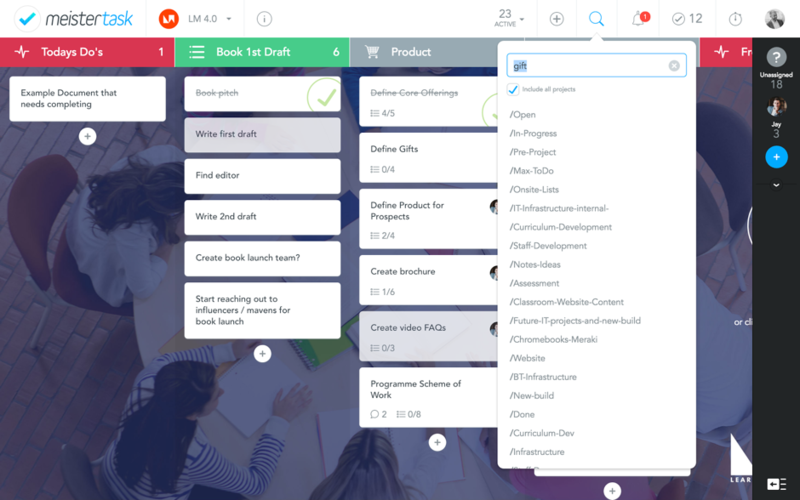 You can quickly search through the whole of MeisterTask in one click. The key to a successfully managed team, and to avoid your own burn out, is to ensure team members are; accountable, responsible, and driven. I have found that initially when we talk about these things, accountability is often misconceived as ‘passing the buck’, with responsibility seen as forced delegation. Staff gather evidence to cover their back, rather than focusing on the positives of the challenge. I’ve found that by having a system where staff can see everything that’s going on, with the number of private conversations and projects minimised, this issue quickly fades. 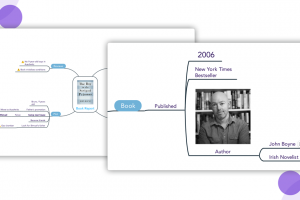 A way to achieve this is by having a system which encourages the ‘informal’, allowing users to add profile photos so that everyone can see who has been delegated each task. A massive benefit to allocating tasks on MeisterTask is the ability to hand over work when team members leave or join the project. There are many occasions where teachers do this, particularly new or training teachers who need to be orientated. 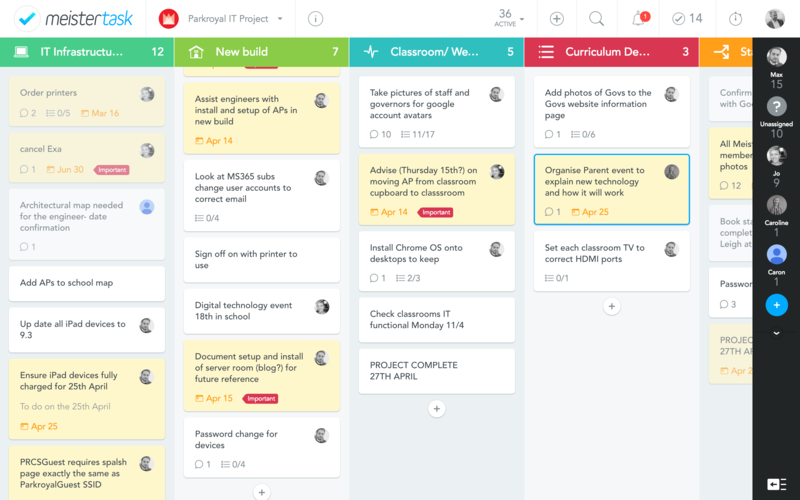 A project management system like MeisterTask, allows new team members to be delegated tasks quickly and simply, as well as see what their colleagues are up to within the project overview. Two things that always ring true in life: there is never enough money, and there is never enough time. Being able to save or reduce either of these is the golden ticket to great project management. When I look at the volume of emails school leaders have to tolerate, I go mad. If we just focus on emails relating to project management – the emails notifying changes, asking for ideas or for approval – the emails still take time to process. Not long for each one, granted, but the sum total of the minutes are significant. By simply moving this type of email into a project management system, you will be surprised by how much time is freed up. 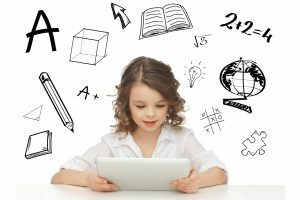 In one primary school we managed to save over 4 hours a week by simply changing attitudes to email use in school. One 30-minute session on using email led to 4 hours saved per team member, which for a team of 7 meant 28 hours a week or about 1000 staff hours a year. Big numbers, by just working a few little things out. 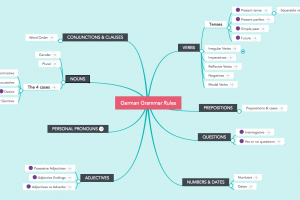 I first started using the free version of MeisterTask when LearnMaker was launched. When Jay and I started the company a few years ago, we had very little money, we joke we were living on beans, and it wasn’t that far off! We made the decision early on that we would need to be device agnostic, as our consultancy would focus on ideas and attitudes, not brands or devices. As such we wanted to shift as much of the ‘work’ our IT systems would use, into the cloud. In theory this is a great idea. Although, most cloud solutions cost, MeisterTask was the only free system I could find which integrated for free into Google Drive. For me this was key. We used Google Drive as a cheap alternative to expensive servers at the company offices, reducing costs massively. Subsequently, moving to the cloud is something we suggest to every school we work with. I have successfully managed 5 school projects using the free versions of MeisterTask, all concurrently. If you have the money, the Pro level is fantastic but you can even benefit instantly from using the free version. Money constraints shouldn’t limit you when wanting to use a project management system. 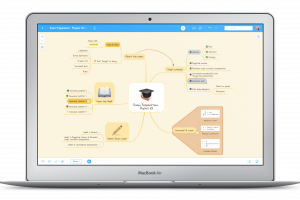 LearnMaker have used free versions of MeisterTask to manage large and complex projects in the past.